This is an outdoor park with over 470 acres of land, most of which remains undeveloped. There are sports venues, such as baseball and softball fields, tennis courts, basketball courts, and a soccer field. 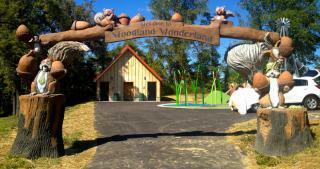 There is also play equipment, a picnic area, and a trail that runs throughout the park. This site contributes both to the environmental and social equity aspects of sustainability; the forestry and animals within are protected, and the park, having no admission cost, serves all members of the community equally, promoting mental well-being.